Doing anything noteworthy by yourself is close to impossible. When we see people who have created incredible services, it is often built from the input of hundreds. This is the idea of making stone soup, a concept from Peter Diamandis book BOLD. Boiled down (pun intended), the story is about how you make something from nothing by reaching out to others and make them excited about your idea. It is worth a quick 2 minute read. We are not all surrounded by the people who can give the right input to make our dreams a reality. But somewhere in the world, there are people that are willing to help you scale your ideas. It is on based on this idea that the immensely inspirational Daniel Gross created Pioneer. Pioneer is an open global community for creative young people working on interesting projects. You can apply with anything. Your research, a company, art, everything. Every week you submit a status update on what you are working on, how you progressed since last week & what you will achieve next week. Based on this, 20 peers from the community upvotes or downvotes you compared to another random project on the platform. 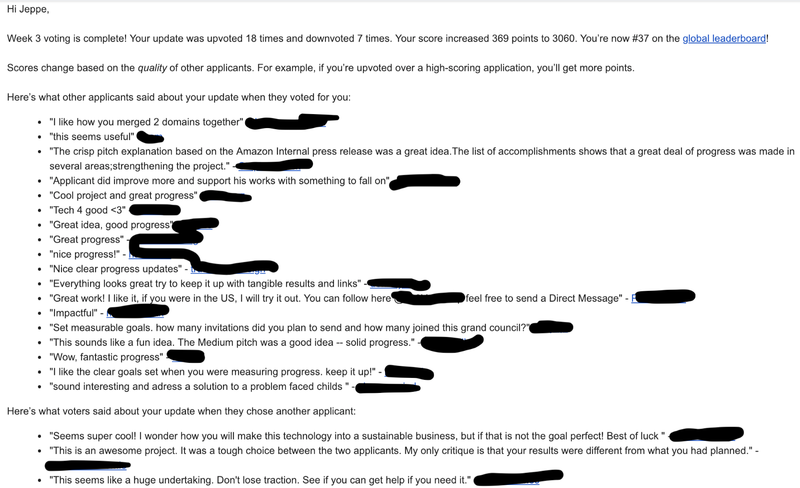 After that, you get a mail with feedback from the users who have voted on you and with information on how many points you have gotten. Every week for 1 month. My brain is not always rational. I can get myself to do many things, but having weekly goals apparently kept me to another level of accountability. Knowing that a group of people will see if I actually do what I set out to do was weirdly motivating. 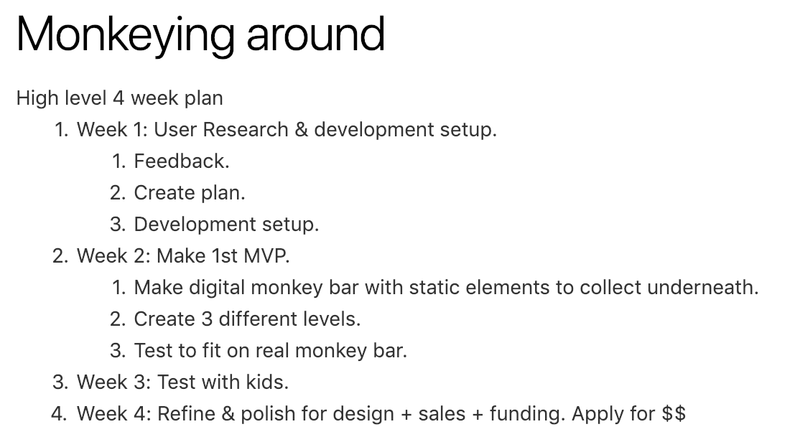 Besides just getting something done, the community pushed me to get the right things done. When I was reading and voting on other applicants, I also got motivated & inspired to do specific things. Reading about others testing their MVP with users or pitching their ideas to organizations pushed me to overcome my fear and do that as well. The feedback was good, but not enough. However, it inspired me to seek out more feedback. 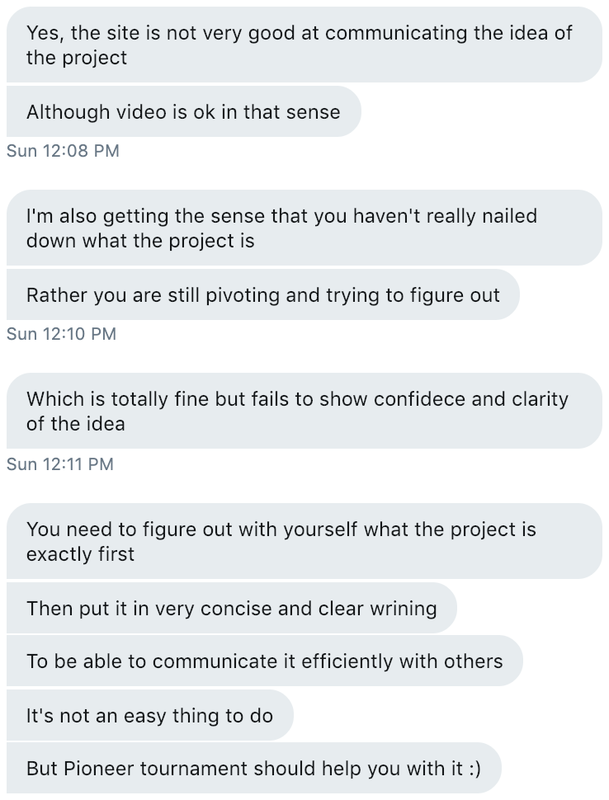 One incredibly valuable interaction I had was with one of the previous Pioneer winners that I reached out to on Twitter. After weeks of getting feedback saying my idea was great and all, finally somebody gave honest useful critical feedback. Of course, it hurt at first. Looking at my site I did understand him though. If a complete stranger landed on my page, they wouldn’t have understood exactly what it was about. One day of interaction with him I learned more about communicating clearly than I had in a long time. Life is really too short to not give people the right harsh feedback their projects deserve. Dylan Field — CEO of Figma — for his eye for design. Star Simpson — CEO of CorvidAir — for her maker spirit and inspiring portfolio of unusual interesting projects. Ben Reinhardt — Entrepreneur In Residence at Susa Ventures — for his previous experience with AI & AR at Magic Leap. .. These are not the type of people I usually have access to if you are wondering! I want to highlight especially an email exchange I had with Star Simpson that made me rethink what the entire idea could become and how I should think about my users. Daniel Gross is definitely achieving his goal with Pioneer of guiding aspiring entrepreneurs and nurturing their minds. The power of community is incredible. Winning the tournament would be an extra benefit, but being a part of this community for the last month has helped me turn my idea from a mere dream into something I actually believe in. In a post about why Pioneer was founded, Daniel highlights how important it was for him in his journey to have someone actually believing in you. When you feel that people believe in you, you get inspired to make things happen. Finding Pioneer has reenergized me to seek out the communities I need to make the life I want a reality.